I was just getting used to the generally innocuous bugs in my house until I met the world’s largest HORNET! 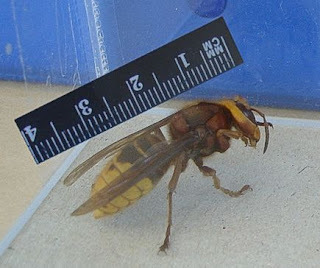 Apparently, it is called a european hornet, and while it may not be the world’s largest, it is pretty much the scariest thing I have ever seen. They are around 1.5 inches long, and look as though they would deliver one incredible sting (I would say deadly sting, but Wikipedia claims otherwise). My terrifying encounter with this giant hornet came one night while talking to a friend on the phone while in bed. Gilles, my protector and chief bug-killer, was conveniently away. Suddenly, one flew into my room. I immediately hid under the duvet, shaking and talking to my friend in a hushed voice in case ‘he’ could hear me. After a few minutes of listening to it buzzing around my room and colliding into walls, I knew I had to muster up some nerves and kill the damn thing. So, armed with the latest copy of Elle, I set out on a hornet-hunt. Fortunately, this hornet’s enormous size makes him a little slower than the wasps/yellowjackets/hornets I am used to. So, I squashed this guy good, and despite my shaky legs I was rather proud of myself. I decided not to close the windows, figuring the last visit was a rare occurrence. Nope! No sooner was I done washing hornet guts off my wall did another one fly in! After giving myself another pep talk, I killed hornet number two. Ironically, I later read that they are an endangered species, and one can be fined 1,000 euros for killing a european hornet in Germany. Oops. Good thing I don’t live in Germany! I now sleep with my windows closed, but every now and then am awakened in a fright by the sound of the giant hornet’s buzz…all in my head, of course!